What is the easiest way to install openMSX? Should I download the Zip or the Installer for Windows? Why doesn't openMSX come with system ROMs? Where do I install the ROMs? Is openMSX easy to use? All I get is "Cartridge not found." What's wrong? I get "Fatal error: No drive named 'diska'." What's wrong? It looks like only ROMs are supported. How can I run disk and tape software? What is the openMSX harddisk support? It seems the MSX hangs when running GFX9000 software; what's wrong? Great, those OSD LEDs! How do I get rid of them? Where is the full list of commands and settings? How can I speed up openMSX? How hard is it to emulate an old MSX on a modern PC? How do I create perfect play videos, like Vampier's YouTube videos? How do I use openMSX for TAS (Tool-Assisted Speedruns)? What codec do you use to record videos and where do I get it (because I only get blackness in my videos)? Why do I hear serious sound glitches and/or stuttering, especially when using Windows? Where can I find more technical info about openMSX? openMSX used to be difficult to install, but it isn't difficult at all, nowadays! At least: it shouldn't be. The easiest way to install openMSX is by running the installer. Download the installer from our website (check out the Download box), unpack the .zip file, and double-click on the resulting .msi file. After this, you should have a working openMSX and openMSX Catapult. You can also download the Zip distribution which contains only the emulator files (no installer) and unpack it to the directory of your choice. The easiest way is to get the .dmg file from our website (check the Download box). There is no Catapult for macOS yet, but NekoLauncher openMSX is a very good alternative. If this site gives you problems, check the mirror download site. And of course you can also use the built-in OSD menu, open it with Cmd+O or by clicking the tiny menu button in the top left corner. Install the openmsx, openmsx-data, cbios and openmsx-catapult packages. The simplest way is to run aptitude install openmsx-catapult, APT will install the other needed packages as well. The Ubuntu packages are similar to the Debian ones. You can find them in the "universe" repository, so make sure you have that enabled in your /etc/apt/sources.list. Fedora has packaged openMSX in the main archive since Fedora 7. You can just run yum install openmsx to install openMSX. Catapult does not seem to be packaged yet at the moment. You can find an ebuild for openMSX in the "games-emulation" category. Catapult does not have an ebuild yet. openSUSE 10.3 (and 11.x) seems to contain an openMSX package, but it seems to be somewhat outdated. You can find binary packages for Pentium 2 and higher on the Linux Packages site, but they seem to be somewhat outdated. There seem to appear at least source RPM's on the RPMFind.net search for openMSX sometimes, but we don't know how to use them exactly or if they are also included in the official distribution. There are packages for openMSX and Catapult in the ArchLinux User-community Respository (AUR). It is possible that openMSX has been packaged for other Linux systems as well, but we are not able to keep track of them all. Search in your package management system for openMSX and there's a fair chance that openMSX will pop up. If it doesn't, see a few lines below at "other". There is a port for openMSX in FreeBSD. It is called simply "openmsx". There is also a port for Catapult. There is a port for openMSX in NetBSD, but it seems to be somewhat outdated. There is no port for Catapult yet. You'll have to install openMSX from source. This is not as complicated as it sounds, because we have automated most of the process and documented the rest. Just read the Compilation Guide. Note that in any case, there are no system ROMs installed, so only the C-BIOS machines work out-of-the-box. See also the next couple of questions. If you still think openMSX is difficult to install, please tell us why! We strongly recommend to use the installer. It contains a straightforward Windows Installer package. With the installer, your openMSX experience is only about 3 clicks away. The Zip file is meant for experienced users and those familiar with openMSX and emulators in general. The MSX system ROMs are copyrighted. In other words: it's illegal to include them in our software package without a license. The Setup Guide contains a section about system ROMs. You can put all the ROMs in a file pool, which is a central directory in which openMSX looks for files. The default location is share/systemroms. If you want to tweak this, add locations or get a list of all file pools, take a look at the filepool command. See also the Setup Guide. Ever since openMSX comes with the optional GUI dubbed "openMSX Catapult", it is quite easy to use! The Windows installer installs it by default. For other systems, the same counts as for openMSX itself. Check out the Catapult manual for more information. For basic usage, you just select a machine to run and click on "Start"! An alternative to Catapult, is the built in OSD menu. You can call it by pressing the MENU key (or Cmd+O on Mac) or by clicking the tiny menu button in the top left corner. This menu is also used on handhelds, like the Dingoo. Catapult and the OSD menu don't give you access to all features of openMSX, though. You can do a lot more by using the openMSX built-in console. You can read a lot more about this in the User's Manual. It's not a GUI, but we did our best to make this console as easy to use as possible. If you think openMSX is not easy to use, please tell us why! Contact info is in the manuals. Oh, you might wonder: why don't you make a normal GUI like other emulators? One in which the emulation is inside the GUI? The reason is that we are currently not able to make that: the GUI toolkit we use does not support it and we want to keep the GUI optional, so we cannot make it part of the main application. All I get is "No cartridge found." What's wrong? openMSX doesn't come with any system ROMs, see Why doesn't openMSX come with system ROMs?. To have something to be able to run some software, openMSX comes with a free replacement of an MSX BIOS ROM called C-BIOS, written by BouKiChi, Reikan and nowadays the C-BIOS Association. This is also what you can see in the screen: C-BIOS 0.25. So, the message is not from openMSX, but from C-BIOS, an MSX program which tries to start a cartridge that is inserted in the MSX that is being emulated by openMSX. And it seems you didn't insert any cartridge for it... So, either run openMSX with a ROM image or install real MSX system ROMs for a certain machine and run that one. 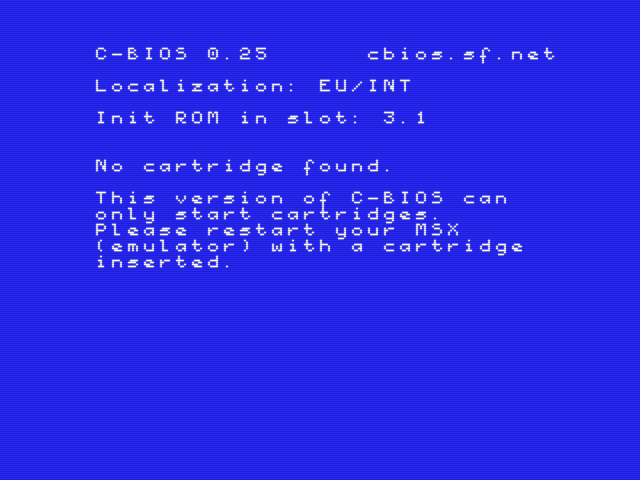 Note that the current version of C-BIOS can only run cartridges and does not support disk or tape usage. More information can be found in the Setup Guide. You are probably using Catapult with C-BIOS and you're trying to run a program on a disk image. Unfortunately, the C-BIOS machines that come with openMSX do not support disk or tape usage. Please see the Setup Guide. The tricky thing is that the old (current) version of Catapult always shows the disk, tape and cartridge controls, independent whether the machine you're emulating actually supports them. This will be greatly improved in the new (upcoming, but not finished) Catapult. If you want to use disks or tapes with your emulated MSX, you will have to install the system ROMs of a real MSX (one with a disk drive!) to emulate that one, until C-BIOS supports this as well. More about this in the Setup Guide. You probably are running the C-BIOS machines that came with openMSX and did not install any system ROMs of other machines (or did not choose to emulate another machine). The C-BIOS machines rely on the freely available C-BIOS ROMs and that's why we can ship them with openMSX. However, C-BIOS only supports ROM images for now. More information about that in the C-BIOS section of the Setup Guide. If you want to run software from other media (disks, tapes, etc. ), you will have to install other system ROMs, which are from real, existing MSX machines. Then you can run other MSX machines than the C-BIOS machines, which do support tape and/or disk software (depending on the emulated MSX model). More about this in the Setup Guide. You've been playing a game and want to continue another time, so you want to save your progress. You can either save your game as you would on a real MSX, or you can use the built in save state mechanism, which is explained in the manual. Some disk-based games save on one of the game disks. Make sure the disk is not write protected; in openMSX this means the disk image must be an ordinary DSK image (not compressed as ZIP or XSA) and not read-only. Some games save on a separate disk. You can create an empty disk for this purpose by opening the openMSX console with F10 (Cmd+L on Mac) and executing the command diskmanipulator create filename.dsk 720. Since many games save in fixed sector locations instead of files, it is best to reserve a separate save game disk for each game. The PAC and FMPAC contain a bit of battery-powered memory that can be used for saving games. Make sure you insert the pac or fmpac extension when you start openMSX. The SRAM is divided into 8 blocks and different games typically use different blocks. However, there are many games using the SRAM, so it is unavoidable that some games use the same block. If you play more than one game and want to be safe, copy the .pac file from "persistent/fmpac/untitled1" in your openMSX user directory (see this overview where it is for your platform) to a safe location. The Game Master 2 can be used to save many Konami games. Insert both the game cartridge and the Game Master 2 cartridge. Some cartridges games, for example the strategic games from Koei, have SRAM inside the cartridge. You don't have to do anything special to use this. Saving to tape is a bit clumsy, but for some games it's the only way. Note that the current version of C-BIOS does not have tape support, so if you want to save to tape, make sure you use a machine based on the original MSX system ROMs. Many people wonder how to save in Metal Gear. Here we will explain how that is done on a real MSX, which is also the way to work if you don't want to use the built in save state mechanism of openMSX. Press F1 and then F5 and you can save on tape. Insert a tape with the console: F10 (to open the console) and then type cassetteplayer new filename.wav, where filename.wav is the (optional) name of the tape file that will be created to save the game to. Type the file name in the Metal Gear game (can be any name, but you need to remember it! Choose something easy.) and press enter. The game will now save to that filename.wav cassette image file, under the name you just entered. To verify: in the console type: cassetteplayer rewind and then press "Y" in the game to verify. You can also skip this step. Note that saving in this way is only useful after reaching the elevator. You will continue in the last elevator you were in. The special way. This is done with the Game Master 2 cartridge. You will have to start openMSX with both the Metal Gear cartridge and the Game Master 2 cartridge. The Game Master 2 cartridge should be in a lower slot than Metal Gear (mention it before Metal Gear on the command line, for example). After booting, select "GAME" to start Metal Gear. At any time during the game, press the MSX STOP key (F8 in openMSX). The CAPS LED will light, which means you are now in the Game Master mode. Press CTRL to open the save and load menu. For this to work, you need an MSX with a diskdrive (again: not C-BIOS yet!). Insert a (blank) disk in the openMSX diskdrive. This can be a disk image you created with some external tool, but you can also create one from within openMSX itself: in the console, type diskmanipulator create filename.dsk 720. Then insert the disk image in the drive: diska filename.dsk. Choose "DISK SAVE" in the game from the menu. Choose "GAME DATA" in the DISK-SAVE menu. Input a filename for your save game. This will be the name of the file that that will end up on your disk image called filename.dsk. The game will now be saved to disk. After saving, choose "END" and press the STOP key again (F8). Press F1 and then F4 in the game and you can load from tape. Insert the tape image into the cassetteplayer by typing in the console: cassetteplayer insert filename.wav. Type the filename you choose for the save game in step 1c above. The game will now load the save game and start. If you want to retry, don't forget to rewind the cassette by typing cassetteplayer rewind in the console. Start Metal Gear as described in steps 2a to 2c above in the saving instructions. In the save and load menu, choose "DISK LOAD". Insert the disk image which you inserted in step 2d above, to save your game on: diska filename.dsk. The game will list the files on the disk that are save game files. Select the one you want to load and it will be loaded. Choose "END" and press the STOP key (F8) to resume the game. This is explained in the User's Manual. The real GFX9000 has an external video connector to which you can connect a second monitor. Because of limits of the SDL library we used to create openMSX, we cannot have more than one window for openMSX, so we cannot emulate a second monitor. To see the GFX9000 in action, you need to switch the videosource setting, which equals to a so-called SCART-switch in the real world: set videosource GFX9000. If you started openMSX without GFX9000 extension, this videosource is not available. To get your normal MSX screen back, you should type set videosource MSX. If you want to toggle with a hot key between them, it might be useful to bind a key for it. E.g. : bind F6 cycle videosource. cycle is a Tcl command that cycles through the options of the setting in the parameter. Instead of using the GFX9000 extension, we recommend you use the Video9000 extension (also present in several Boosted MSX machine configurations). This makes the switching go automatically in case the software is Video 9000 aware (e.g. all TNI GFX9000 products). When using this extension, the default value for videosource is Video9000. Note that GFX9000 emulation quality is not as good yet as the classical MSX video chips. See also the corresponding section in the User's Manual. The full list of commands and settings that are available in the console can be found in the Console Command Reference. Check it out, it's really useful! Actually, openMSX is quite fast, depending on what you ask it to do. If you have minimal hardware, you should use minimal settings as well, to get decent speed. This was proven by Karloch who ran openMSX 0.6.0 on a 206MHz HP Jornada 720, see this thread on MRC. On PC's, it really helps if your graphics card is not slow, or actually, the pipe between the CPU and the graphics card. Tips on how to performance tune openMSX can be found in the Setup Guide. The developers do their best to keep the performance of openMSX as good as possible, whilst still achieving the highest level of accuracy that we can. In general people wonder why you need 200MHz+ machines to emulate a computer based on a 3.5MHz CPU. Well, you don't only have to emulate the CPU, you also have to emulate the VDP (21MHz), the monitor (writing at least 50 times per second at least 256×192 pixels to a window), the sound chips, etc. This is relatively simple hardware, but having that run in software with cycle accuracy is quite heavy. In general, it is a lot of work for a general purpose CPU to emulate functionality that was originally made in dedicated hardware. Rebuilding an MSX in general purpose hardware (using VHDL on FPGA) is already a lot less demanding. An example of this is the One Chip MSX. The trick is to use the reverse feature to correct any mistakes you make during game play. You just play, play, play, correcting all mistakes you make by going back in time a bit (using PageUp) when you (e.g.) die and doing it better. As soon as you get to the end of the game, we recommend to save the whole replay (using the reverse savereplay), so that you can always load it and play it again (using reverse loadreplay). So finally, start recording and unpause openMSX. If you want it quickly, run in full throttle (F9 by default) to speed things up. The resulting movie will be the same. If you want to split up the recorded video in chunks that are accepted by YouTube, you probably want to look at the record_chunks command. Easy! Now fill up YouTube with MSX material! If just creating perfect play videos isn't enough for you, you are probably going for Tool-Assisted Speedruns, of which you can find all information on tasvideos.org. The rest of this item gives you some hints to help you with this. First of all, the basics are explained in the previous section, of course. But you can get extra tools if you enable the TAS mode, of which we won't repeat the explanation here. If you need also a live RAM watch, check out the ram_watch command. It enables you to add live views of values on multiple addresses with several view options, like titles, formats and data types. This is mostly motivated by the fact that Japanese machines run at 60Hz interrupt frequency and the Japanese games are made for that. Besides, you will get proper Japanese characters with a Japanese machine, which are often used in such games. The mentioned machine can run practically all Japanese MSX/MSX2/MSX2+ games and has FM on board. For European games, the 50Hz (PAL) Philips NMS 8250 is recommended, just because it's very common and runs most European MSX and MSX2 software. The FMPAC extension is for better sound. There are no native European MSX2+ machines. When doing MSX TASing, be aware that (unlike consoles), MSX machines have full keyboard attached, and touching them means input for the MSX. And that means you will interrupt the replay if it's playing. You can avoid this (when merely viewing a replay) by using the -viewonly option when using the reverse loadreplay command. The keyboard problem also means that it's a bit tricky to assign keyboard shortcuts (with the bind command) to (e.g. TAS) functions, without also blocking MSX keys. So, be careful which keyboard shortcuts you configure and which keys you press. Now it's time to make a TAS and submit your entry on tasvideos.org! A final note: if you have problems replaying other people's TAS (or other openMSX replay), because openMSX can't find the required media (ROMs, disks, tapes, etc. ), make sure you put the required media in the proper filepool; by default share/software. The ZMBV (Zip Motion Blocks Video) codec is used, which has been developed in the DosBox project. It enables openMSX to encode video in real time (on most systems), has a very good compression ratio and gives excellent video quality, because it is a lossless codec. Razor sharp movies! Also, because the encoder is built in, it doesn't make openMSX depend on an external codec to be installed for recording video. A developer of DosBox built a Win32 binary of the codec for our users. It is included with openMSX 0.6.2 (and up) for Win32. Note that the installer does not install the codec by default, so you will need to enable this option when installing. You can also download the codec separately from our web site. After unzipping the file, use the .INF file to install the codec (zmbv.dll) by right-clicking on it and selecting Install. Note that other binaries of this codec that you can find on the internet may not work, as not all of them have support for more than 8 bits per pixel recordings. Also note that this is a 32-bit codec, so it will not run inside 64-bit Windows Media Player or Windows Media Center. You only need this codec installer to be able to replay the videos on a Windows system. (Although a workaround could be to upload it to Google video, where it is re-encoded into a lossy MPEG-4 format.) Programs like Virtual Dub can use the codec and re-encode it in another way. On other operating systems, you can use any video player which supports this codec; e.g. mplayer. Re-encoding can be done with e.g. mencoder. Not sure, but for some reason, especially on Windows, we can't find default settings that work for everyone. If you indeed have glitches like sound delay or stuttering, you can try the following. Chances are that your CPU load is very high, which may cause stutters. Check the Performance Tuning section of the Setup Guide to see what you can do to get it lower. Also, peaks in CPU usage (e.g. caused by certain P2P programs) can cause stuttering, in some cases. Try to tune the value of the samples setting. If you have stutters, double it and see if that helps. If you have delays, halve it and see if that helps. Next to the openMSX manuals (which includes documentation on how you can control openMSX from an external application, so that you can make your own GUI, launcher or debugger), also check out the doc directory of your openMSX distribution. We have a nice set of manuals describing most of the functionality in openMSX. The manuals of Catapult, the graphical interface to openMSX. Look here if you have a question that is not specific to openMSX, but about the MSX system itself. You can post your questions here. The openMSX developers and testers hang out on this channel (chat room). If the link doesn't work, try the webchat or get an IRC client, go to server irc.freenode.net (freenode network) and join channel #openmsx. It is possible you will not get a reaction immediately, so please ask your question, stay logged in and check from time to time if someone is active.